There are no A sizes in this material. Suitable for interior design, facades, signage, prototypes, etc. Unfortunately, it is not possible to laser engrave steel. Top side – No burn marks, but small soot markings can appear from the laser cutting. These can easily be wiped off. Edges – Appears sharp and in the same colour as the material. 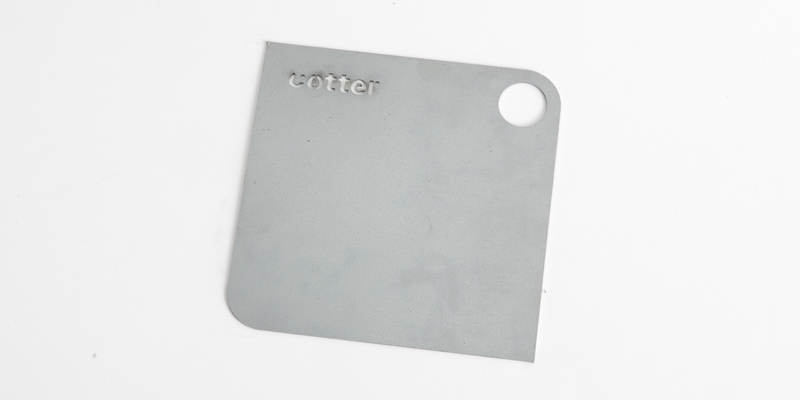 Bottom side – Small scratches can appear from the foundation from which the plate is laser cut. Soot markings can appear. These can easily be wiped off. The lower edge can be very sharp after the laser cutting and should therefore be rubbed down. Steel can easily be painted after laser cutting. It is recommended to wipe off the plate with acetone (or similar) before painting.